Sudbury, ON (June 21, 2017) – After a seven month long build, the Hydraulic Air Compressor (HAC) Demonstrator at Dynamic Earth has officially opened. The 100 feet high (above and below ground) industrial scale system for testing and demonstration of compressed air production is installed in a former elevator shaft at Science North’s Dynamic Earth in Sudbury, ON. This innovative technology provides an energy efficient alternative to conventional mechanical air compression that promises up to 50% savings in lifecycle cost for mine operators and other industrial scale users of pneumatic power. 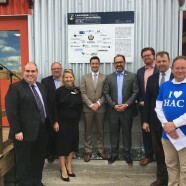 The HAC Demonstrator project is a joint undertaking of the Ultra Deep Mining Network (UDMN) – a business led-NCE, with MIRARCO Mining Innovation, Laurentian University, Electrale Innovation Ltd. and Reasbeck Construction. Canada’s Ultra-Deep Mining Network, hosted at CEMI, continues to make strides in resolving the challenges that impact resource extraction in ultra-deep (below 2.5km) environments. This UDMN project was combined into two phases: research and construction, with a total value of $3.375 million. Significant financial contributions included: $463,000 through the province’s Northern Ontario Heritage Fund Corporation (NOHFC); $499,000 from the Independent Electricity System Operator’s (IESO) Conservation Fund; and $620,000 from Electrale Innovation Ltd and MIRARCO – Mining Innovation, with contributions from Victaulic Canada and KROHNE Canada. Additional support was provided by Science North / Dynamic Earth, Vale Canada, the Ontario Trillium Foundation and the Canada Foundation for Innovation (CFI). The construction project was a team effort coordinated by general contractor Reasbeck Construction Inc. with project management by the Centre for Excellence in Mining Innovation (CEMI), that drew upon the skills and services of numerous Sudbury-based businesses: Specialty Alloys and Stainless, Talevi Welding and Mechanical, Hanking Mechanical, Fuller Industrial, Sling Choker, Flynn, Admira DHES Inc., Riventa Canada, Blackrock Engineering, Nortec Industries, IONIC Engineering, KROHNE Canada/Bridson Process Controls, Synergy Controls, Cementation Canada, and Victaulic Canada. The Cambrian Innovates team at Cambrian College was commissioned to fabricate the air-water mixing head, a specialty item that followed a design created by Charles Havelock Taylor in 1905 for the HAC embedded in the concrete abutments of the Peterborough Lift Lock, on the Trent-Severn Canal, now operated by Parks Canada. At the opening event, guests met the HAC team, partners and sponsors and those who contributed to the build, they were guided on a tour of the facility by the project team members, enjoyed BBQ food and listened to a special briefing from the project leader, Dr. Dean Millar, entitled: What the heck is the HAC? Hydraulic Air Compressors promise low cost, low carbon, energy efficient compressed air for all industries requiring pneumatic power, but there is a special synergy with the mining industry because the systems have great vertical extent. The objective of the wider project is to lower the cost of energy for mine operators to help maintain the global competitiveness of the Ontario Mining Industry. One intended new use for the compressed air produced by a HAC is for refrigeration of ventilation air for ultra deep mine cooling. Once the facility is opened, innovators from MIRARCO, scientists and engineers from Laurentian University and engineers from the industry partners will work collaboratively to prove the energy efficiency of the systems and to investigate their feasibility for mine cooling, gas liquefaction and carbon capture. Electrale Innovation Ltd is already exploring commercial opportunities for this energy efficient technology. “This UDMN project will show that hydraulic air compressors will be able to supply compressed air to provide a novel technique for mine air cooling in ultra-deep mines, and that it can do so safely, cheaply and reliably. This will increase the ability of mines to improve productivity in both development and production processes,” stated UDMN Network Director and CEMI President & CEO, Douglas Morrison.